Decode 'nonsense' words to engage students' brains and their understanding of the synonyms for the word, nonsense. 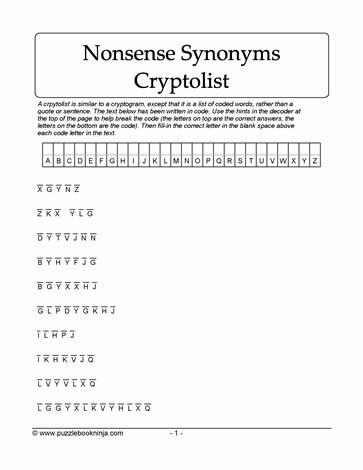 Downloadable synonyms for 'nonsense' cryptolist printable puzzle. Students must decode the encoded words using problem solving strategies and knowledge of word structure, letter patterns and sequences. Students can use the table on the puzzle sheet to record the letter substitutions. Printable puzzles suitable to home schooling environment and students in late elementary grades 5,6,7 classroom. Support more vocabulary building and grammar words with our multiple categorized printable puzzles.